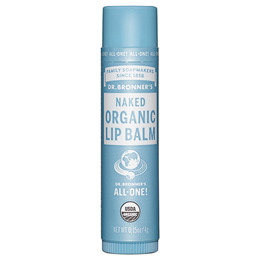 Dr Bronner`s Organic Naked Lip Balm, made with organic beeswax, provides a protective barrier to the elements without any synthetic ingredients. Persea Gratissima (Avocado) Oil, Simmondsia Chinensis (Jojoba) Seed Oil, Organic Beeswax, Cannabis Sativa (Hemp) Seed Oil, Tocopherol. Below are reviews of Dr Bronner`s Organic Naked Lip Balm 4g by bodykind customers. If you have tried this product we'd love to hear what you think so please leave a review. A rich buttery smooth lip balm, would highly recommend! I have allergies to 6 different ingredients that are in most every day products,this I can use with no adverse effects. Good lip lube and price. As with all Dr Bronner products excellent quality at a fair price.